What is a whirlpool tub? It’s no secret, taking baths regularly has the potential to lead to a ton of awesome benefits, and we’ve known this for awhile. Bathing enthusiasts know, with a proper hydrotherapy routine, many individuals often enjoy things like: muscle tension reduction, pain relief, stress relief, and more. To help you with your hydrotherapy routine, here at Showersly, we’ve created this page with the 13 best whirlpool tubs 2019 has to offer. As always, it’s important to do your research before you buy. For that reason, make sure to read through all of our whirlpool tub reviews carefully, to ensure you get the best whirlpool bathtub for your money. Without further to do, hope you enjoy our ultimate guide to the 13 best rated whirlpool tubs of the year. Now let’s get to it. With its 20 jet whirlpool system, combined with its easy-to-install freestanding design, this Woodbridge Tub earns our #1 rating. 8 multi-directional jets (2 for lower back), molded-in arm rests, and its Everclean System make this American Standard Tub our best drop-in whirlpool tub. 14 multi-directional whirlpool jets, with 6 water-flow settings, and a beautiful freestanding modern look, make this tub one of our best-rated freestanding whirlpool tubs. Made in the USA, this Carver SKC5555 comes with an inline heater, to make it the best corner whirlpool tub. For those with limited mobility, 3 grab bars, and a 20 air massage jets, make this Arista tub the best walk-in whirlpool tub. 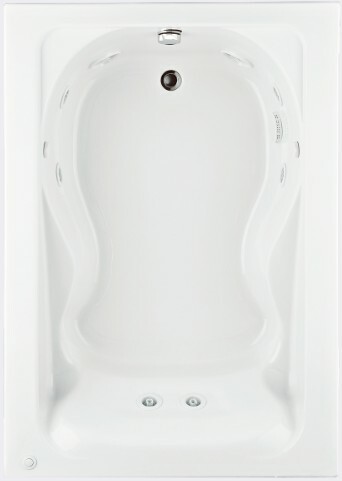 A patented Everclean System, combined with 8 multi-directional whirlpool jets, make this tub the best oval whirlpool bath. A deep soak design, and EverClean System, this American Standard tub the best whirlpool tub with an apron. An integrated faucet, handheld shower, and a beautiful modern-look, makes this MCP a top-rated stand-alone whirlpool tub. Flexible installation (corner, or freestanding), and superior size, make this MCP tub the best for 2. Its EverClean System, molded-in arm rests, and flexible installation, make this American Standard tub a great value. 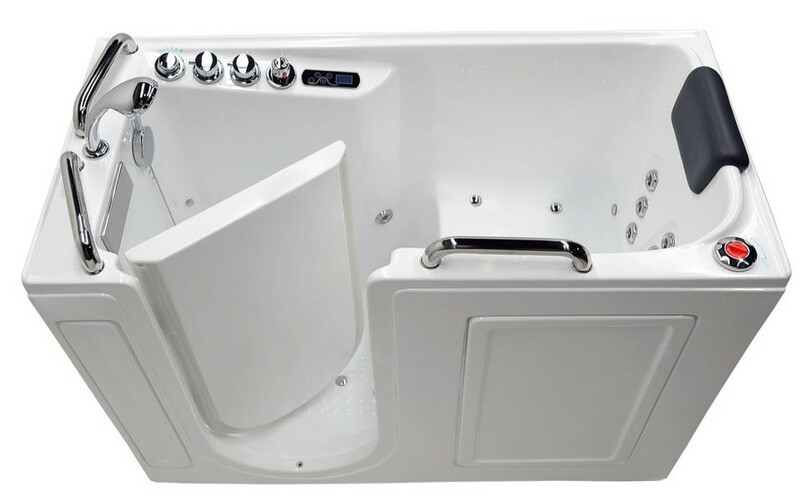 The Carver AR7242 features well-placed whirlpool jets (3 for each persons back), and a deep soak design, earning it its top spot among other drop-in tubs. A super comfortable 2-person cabin, modern freestanding design, and space savings traits, give this EAGO AM200 its rating of the best freestanding corner whirlpool tub. This Atlantis tub boasts a 34 jet whirlpool system, and a relaxation enhancing high-backed design. These accolades, make this tub a top-rated drop-in whirlpool tub. A whirlpool tub is a self-contained bath, designed with integrated water jets. They’re sometimes referred to as the brand name, “Jacuzzi’s,” but other manufacturers specialize in producing them as well. A water jetted tub, or whirlpool tub, by definition is a bathtub that contains jets that shoot out water. For water jet tubs, think of the massage mode often found on multi-mode shower heads. An air jet tub, by definition is a bathtub that contains jets that shoot out air. Since air tubs shoot out air instead of water, this leads to a gentler sensation, but still, highly relaxing. A freestanding whirlpool tub is a jetted bathtub, with edges that are finished on all sides. Freestanding whirlpool tubs make for great center pieces of bathroom re-models, due to the fact that, they don’t require adjacent walls to be installed. A drop-in whirlpool tub is a jetted bath, that is installed into a constructed deck, and surround, with no finished sides. A walk-in whirlpool tub is a jetted tub, that is constructed with a door, designed specifically for those with mobility difficulties. They’re also referred to as, step-in tubs, or accessible tubs. The #1 best whirlpool tub of 2019 goes to the masterfully crafted Woodbridge B-0030 / BTS1606. This acrylic freestanding whirlpool tub from Woodbridge stands head and shoulders above its peers, due mainly to its 20 amazingly relaxing jets: whirlpool water jets (10), and air massage jets (10). The sheer amount of massage power, coupled with the Woodbridge’s awesome price point, makes this quality whirlpool tub unmatched in its category. 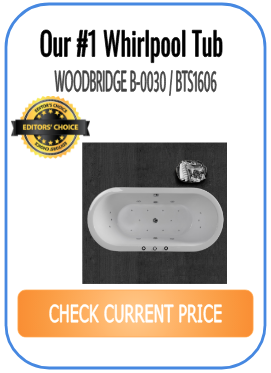 The Woodbridge B-0030 / BTS1606 Whirlpool Tub is a favorite among general contractors, and customers alike. Most reviews frequently mention its superior price, shape/look, and quality. The #2 best whirlpool bathtub of 2019, is the American Standard 2772018W.020 Cadet. 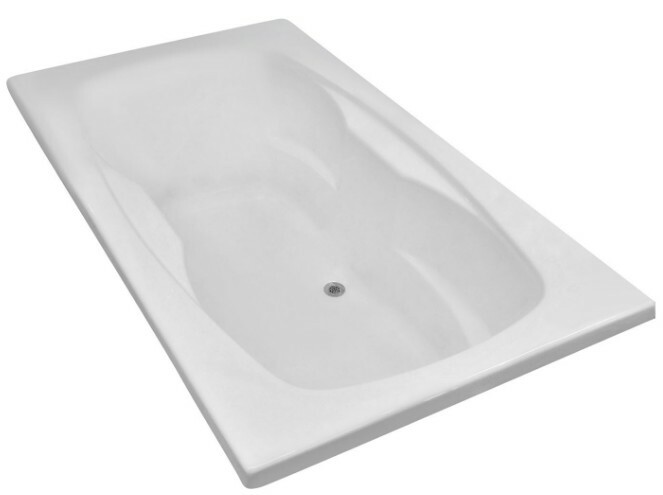 This drop-in whirlpool bathtub from American Standard is made with top quality acrylic, and reinforced with fiberglass. This combo creates a lighter weight tub (that’s easier to install), but at the same time, incredibly strong. Another plus with the American Standard Whirlpool bathtub, is that expert installation services are offered. If you’re looking for this year’s best drop-in whirlpool tub, the American Standard 2772018W.020 Cadet deserves to be high on your list. Customers loved the American Standard Cadet Whirlpool Tub’s 8 powerful jets, and the option to add a heater. Many said the heater was a particularly good investment, given how much water this tub holds. The #3 best whirlpool tub of this year, is the Ariel Whirlpool Bathtub. The Ariel Whirlpool Bath is an absolute modern beauty, and sure to be the most talked about item in your house, once your guests see it in your bathroom. This Ariel whirlpool tub rates high on our list, largely due to its easy installation. With stand-alone models, simply make sure their dimensions fit in your bathroom, and that there’s room for a drain, and you’re half way there. Also, this Ariel whirlpool tub gets its golden stars of approval for its 14 customizable jets. Customers love how the Ariel Whirlpool Bathtub has a simple, and clean style, yet delivers a powerful hydrotherapy experience. Also, many reviews mention that this tub is perfect for two! At #4 on our list of the best whirlpool tubs of the year, is the Carver Tubs SKC5555 Corner Drop-In Whirlpool Bath. 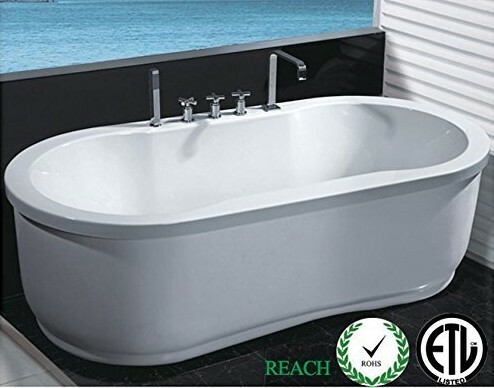 This beautiful whirlpool tub from Carver Tubs finds itself on our list because it is one of the best corner whirlpool tubs on the market, in 2019. The Carver Tubs SKC5555 earns its top spot among other highly rated corner whirlpool tubs due to its superior space savings, ultra-soothing 12 jet whirlpool system, and its ability to fit 2-people (with maximum comfort!). Customers seem to love the Carver SKC5555 for its space saving traits (being a corner tub), and how you can drill your own holes to custom fit a faucet of your choosing. At #5 on our list of the best whirlpool tubs, we have the best walk-in whirlpool tub of the year, the Arista 2753. This whirlpool bath from Arista has everything you look for when selecting a quality walk-in tub. As you’ll notice, the door swings inward, this is key in maximizing the space in your bathroom. Also, the Arista 2753 comes stocked full of jets, 32 to be exact. This is crucial for creating the dream-like spa experience, where you won’t want to get out of the tub (even when your fingers are pruney). Most customers agree that the Arista 2753 is one of the best walk-in whirlpool tubs on the market, and it comes at a great price, too. 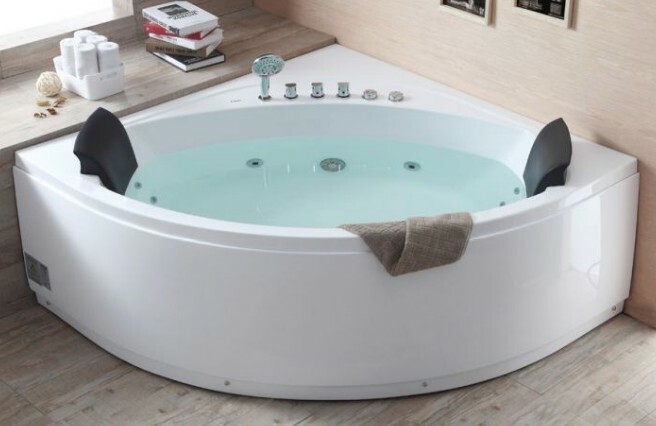 At #6 on our list of the best rated whirlpool tubs of 2019, is the modern-looking American Standard Oval Whirlpool Bath (Drop-in). 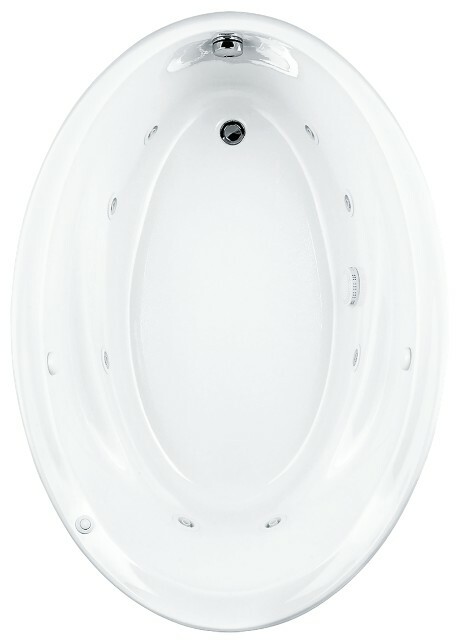 If you’re looking for the best oval whirlpool tub on the market, this is your best bet. This oval whirlpool tub from American Standard, comes with their patented, “EverClean Whirlpool System,” which is a huge plus. The “EverClean System” fights off mold, and mildew build-up, before they even start, by adding an antimicrobial solution to the pipes. Also, due to its unique oval shape, this American Standard whirlpool tub is an absolute show-stopper, when it comes to impressing guests. Customers absolutely love the American Standard Oval Whirlpool Tub with the added Safe-T-Heater. The heater is quick, and easy, to install, and keeps the tub water warmer, for longer! The #7 best whirlpool tub of 2019, is the American Standard Whirlpool Bath – 2425VC-LHO.020 Evolution with EverClean. This acrylic drop-in whirlpool tub, from American Standard, is the 3rd drop-in tub on our list, but it very much deserves to be here. Why? Because it’s the best value drop-in whirlpool tub on our list. If the 1st American Standard drop-in whirlpool tub was too expensive/large, or if the last oval-shaped American Standard drop-in tub couldn’t fit your configuration, this is the whirlpool tub for you. Like other American Standard Whirlpool Tubs on our list, customers recommend buying the additional Safe-T-Heater, to keep the bath water warmer. Also, many reviews mention that the American Standard Evolution Whirlpool Bath was easy to install. 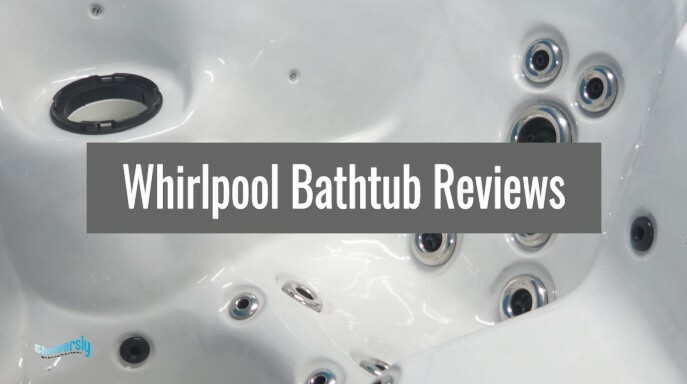 Hope you’re enjoying our whirlpool tub reviews so far! 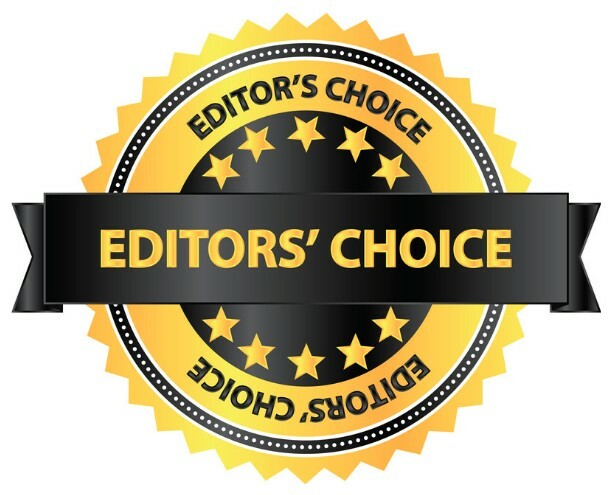 The #8 best whirlpool bath of 2019, goes to MCP Jetted Tub’s Whirlpool Massage Hydrotherapy Bath. If you’re looking for a large stand-alone whirlpool tub, with a modern look, the MCP Whirlpool Tub does not disappoint. From the MCP’s 7 ultra-powerful hydrotherapy jets, to the stylish chrome polished fixings, this tub has everything you look for when picking a quality whirlpool bath. Many customers rave about the MCP Whirlpool Tub’s mighty jets, and their proper placement. When using the MCP’s powerful jets, luckily, you don’t have to fill up your tub all the way. A+ for design. The #9 best whirlpool bath on our list, is the MCP Whirlpool Corner Bathtub (in black). If you’re searching for the best corner whirlpool tub of 2019, or, the best 2-person whirlpool tub, the MCP Black Whirlpool Tub deserves to be high on your list. 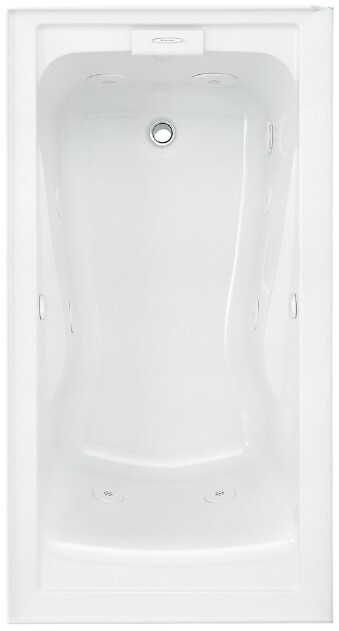 Compared to other top-rated corner whirlpool tubs on the market, this MCP model has a unique rectangular shape, that leads to more flexible installation (can be placed in the corner, or middle of your room). Along with the MCP’s flexible installation, another huge reason we love this tub, is that it comes fully-loaded with 27 soothing hydrotherapy jets (6 are customizable, and 8 are directed specifically at your back, both huge pluses in our books!). 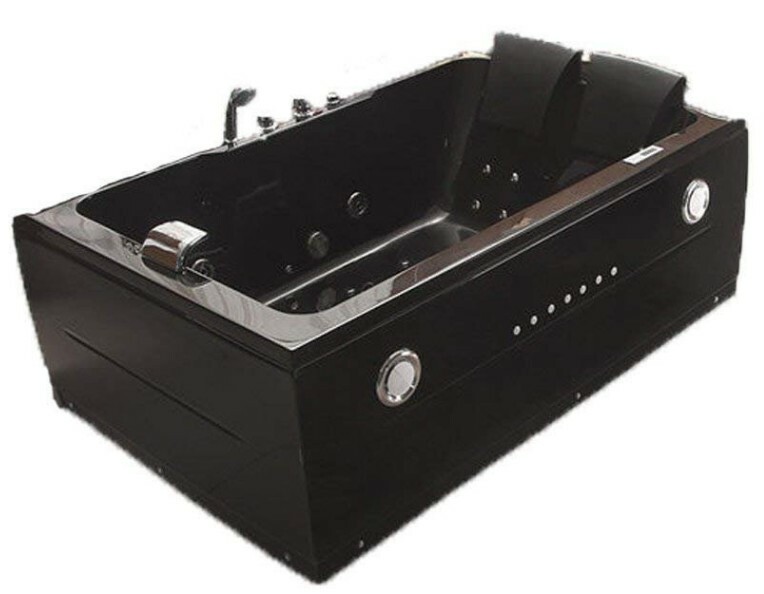 Customers agree that the MCP Black Whirlpool Tub is a fantastic tub, and at an excellent price. 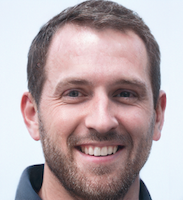 Overall, a great value for how many benefits you’ll get. The #10 best whirlpool tub of the year, is also one of the best drop-in whirlpool tubs of the year, the American Standard 2771VC.020 Evolution. Compared to other drop-in tubs on our list, and in the market, the American Standard Evolution is superior in terms of its length (6ft), among other things, but that’s huge. Unless you have a space confinement, no one likes bathing in a small bathtub, when larger more comfortable models, like the Evolution, are available. Along with the American Standard Evolution’s industry leading size for drop-in whirlpool tubs, it comes packed full with 8 customizable water jets, to create an invigorating spa-like massage experience. Most customers agree that the American Standard Evolution Whirlpool Tub has particularly powerful jets, for the price. Also, most recommend purchasing the additional Safe-T-Heater, to help keep the water warm once it’s in the tub. 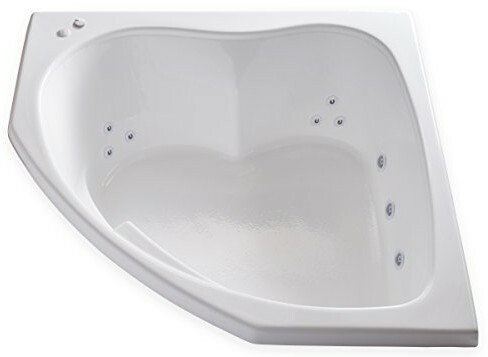 The #11 best whirlpool bath of 2019 is the Carver Tubs AR7242 Whirlpool Tub. This whirlpool tub from Carver earns its spot on our list, because it is one of the best drop-in whirlpool tubs you’ll find on the market. When compared to the other highly rated drop-in whirlpool tubs on our list, this AR7242 is going to be a little more expensive, because of its quality. Given the AR7242’s higher price point, you can expect these advantages over the average whirlpool drop-in tub on the market: a deeper soak (20.5″ deep), more jets (12 jet system), and more targeted back jets (3 for each person). For the Carver Tubs AR7242 Whirlpool Tub, the thing that stood out for most customers, is how awesome Carver Tubs’ customer service was regarding customized jobs. If you want the drain in a certain spot, or jets in a certain spot, Carver will often listen to your needs, and see if they can make it happen. At #12, on our list of the best whirlpool baths of the year, is the EAGO AM200 Corner Freestanding Whirlpool Tub. If you’re looking for the best corner whirlpool bathtubs of 2019, the EAGO AM200 more than earns its spot. Compared to our other top-rated corner whirlpool tub, found earlier on our list (#2), the EAGO AM200 has a freestanding design, making installation much easier. With drop-in tubs, you have to worry about correctly fitting the tub, to your constructed deck. With freestanding models, simply make sure their dimensions fit, and that you can install a drain, then you’re well on your way. Customers love how comfortable the EAGO AM200 Corner Whirlpool Tub is for 2, and also, they enjoy it’s chromotherapy underwater LED lights. 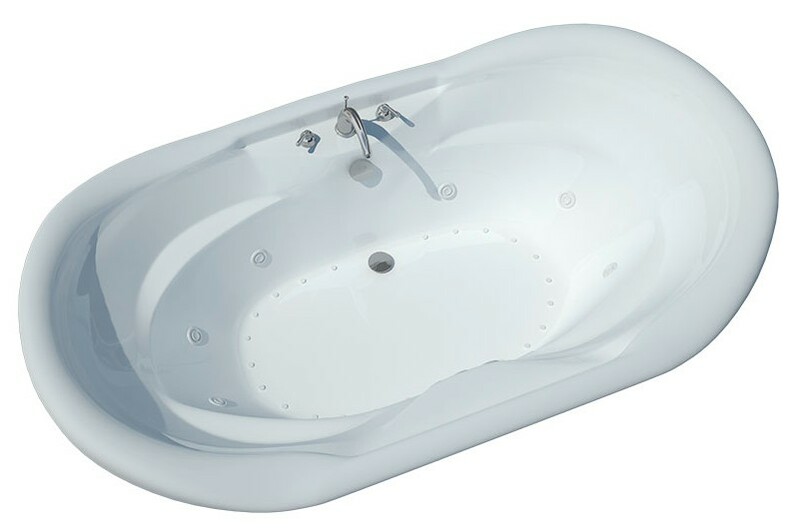 The #13 best whirlpool tub of 2019 is the Atlantis Whirlpools 4170IDR Indulgence Oval Whirlpool Bath. If you’re on your quest for the best drop-in whirlpool bathtub for your re-model, this Atlantis unit is a worthy candidate. The Indulgence Whirlpool Bath earns its stripes from its masterfully crafted ergonomic shape, with high sloping backs, that is perfect for 2-people. Also, if you’re into air bubble massages, you’re going to love the Indulgence’s 26 air ultra-soothing jets. Overall, this Atlantis Whirlpool 4170IDR Tub gets two HUGE thumbs up. 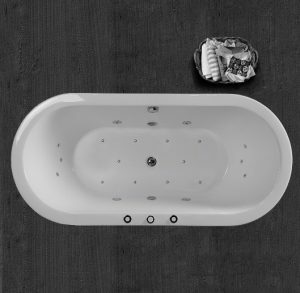 When regarding the Atlantis Whirlpools 4710IDR Indulgence Tub, many couples can’t get enough of this comfortable tub, perfect for two. If you’re looking for the safe way to clean your whirlpool tub, avoiding potentially harmful household cleaners like bleach, and vinegar, check out this short video from Clean With Confidence. Our Favorite Whirlpool Tub Cleaner is …..
Whirlpool tubs work by using an integrated pump, that propels a combination of water, and air, through targeted channels at specific body parts. The act of using heated water to improve things like: circulation, relaxation, joint pain, and the overall body healing process, is called hydrotherapy. For the DIY’ers out there, here’s an awesome how-to video from Bathroom Remodel Videos, showing how to install a whirlpool tub. For those who aren’t DIY’ers, rest easy, because expert installation services are offered with ALL of the tubs on our list. 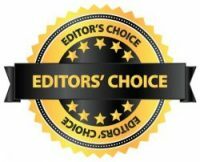 Thanks for checking out our whirlpool tub reviews, where we took the best whirlpool tub brands, and put them to the test. 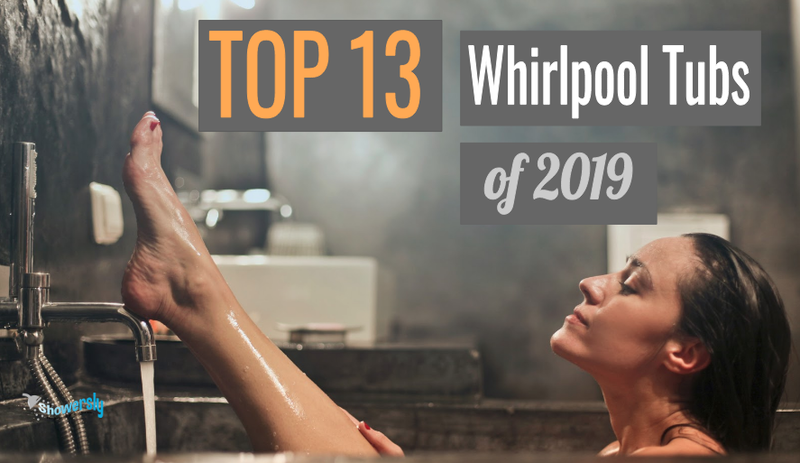 After doing our extensive research, we found 13 of the best whirlpool tubs of 2019, for your bathroom re-model of your dreams. Now that you’ve completed your research looking through the 13 top-rated whirlpool tubs of the year, you’re all set to choose a tub that works best for you. For more awesome bathroom reviews ….. click the picture below!